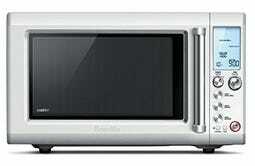 You probably already know Breville makes the best toaster ovens, but their microwave is even more of a game changer. For most of its existence, the microwave has been a compromise: a much faster alternative to (some uses of) an oven with much worse, soggy results. A toaster oven ameliorates some of that, getting oven-like outcomes faster, and with less heat pouring into your house. The Breville Quick Touch Crisp is a long overdue success in closing much of that quality gap. As its name suggests, using an innovative crisper pan, inversion technology, and a broiler, the Crisp has the ability to get food... crisp. In addition to that giant leap forward, the Crisp brings the great design and usable but nuanced controls that we’ve come to expect from Breville. Features like smart reheat and smart defrost actually work on the Crisp, and opening the door reveals a slew of preprogrammed options that cover everything from reheating beverages to popping popcorn to melting chocolate. I’ve been using the Crisp multiple times a week (or a day) since mid-2016, and continue to be surprised at how far it is beyond the competitive set.